Leica has announced the M9-P, a variant of its 18MP full-frame M9 rangefinder camera. The P version gains the sapphire crystal LCD glass previously seen on the Leica M8.2 but now featuring improved anti-reflective coatings for improved visibility in difficult lighting conditions. In order to give an understated appearance, the M9-P omits the traditional Leica red dot and M9 designation from the front of the camera, instead the Leica name is engaved in the metal top-plate in the company's traditional script. Leica today presents a new version of the world's smallest, full-frame digital system camera: the Leica M9-P. This new model will sit alongside the Leica M9 in the company's rangefinder portfolio, providing an alternative, even more discreet and resilient design that further reinforces the quintessential nature of the M9 – and particularly meets the needs of professional photographers. The new model will be available in a classic silver chrome or subtle black paint finish. Offering the same technical specifications as the highly successfully Leica M9, the M9-P combines all the benefits of the original: compact size, full-frame, 18 megapixel 24 x 36mm sensor (35mm format), sophisticated image processing and robust construction, with features designed for the professional user or photographers who prefer a pure, even more unobtrusive styling. 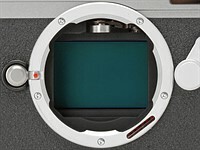 The Leica M9-P includes a scratch-resistant, sapphire crystal covering on the LCD screen. This material is so tough that the screen can only be produced using special diamond cutting tools and is one of the world's hardest materials. As a result, the sapphire glass LCD cover is extremely resistant to wear and almost unbreakable, meaning many years of reliable use. In addition, thanks to an anti-reflective coating on both sides of the cover, reviewing images on the display during composition and after capture is further improved, particularly in unfavourable lighting conditions. The external covering of the body of the M9-P, finished in vulcanite leatherette, features a more coarselytextured finish that ensures a steady grip when shooting, making the M9-P feel particularly safe and secure in the hand. A further understated feature of the Leica M9-P is its minimalist styling, which is focused on the most essential features. Many professional photographers using Leica cameras have been known to tape over the Leica 'red dot' logo to make their equipment as inconspicuous and discreet as possible. 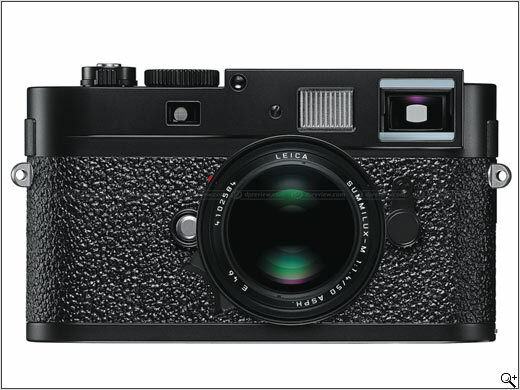 For this reason, the Leica red dot logo and the M9 lettering on the front have been omitted. Instead, the top plate is engraved with the Leica name in classic script form. Since 1954, the Leica M system has represented an unmistakable, individual kind of photography and a very conscious photographic style. With a Leica M, the photographer becomes a 'part of the action' in the process of capturing challenging, authentic and creative images. The rangefinder frames precisely the shot the photographer envisages, while allowing a clear view of the scene outside the viewfinder frame. This allows the photographer to predict the decisive moment and capture it discreetly and reliably at the right moment – in all fields of photography, from photojournalism, reportage and 'available light' to the capture of portraits and aesthetic, fine-art images. Another significant advantage for unobtrusive photography is the almost silent shutter, a feature of both the M9 and M9-P. Moreover, when longer exposure times requiring an extremely steady camera stance are essential, only a slight pressure on the shutter release button in 'soft release' mode is required. Photographers can also select the most appropriate moment for re-cocking the shutter. The functions of the Leica M are consistently constructed for extreme durability and a long working life. The highest quality materials, intricate manufacturing processes and meticulous manual assembly at Leica's facility in Germany guarantee functional reliability for years to come. In line with Leica's commitment to system compatibility, almost all Leica M lenses built since 1954 can be used with the M9 and M9-P – an important factor in the enduring value of the M series. The 18 megapixel image sensor, specifically designed and developed for the M9, enables capture of the full 35mm film format without any compromise. All M lenses mounted on the M9 and M9-P therefore offer the same focal length as originally intended, and the enormous potential performance of the extensive M lens portfolio, with focal lengths from 16 to 135mm, can be fully exploited by both cameras. 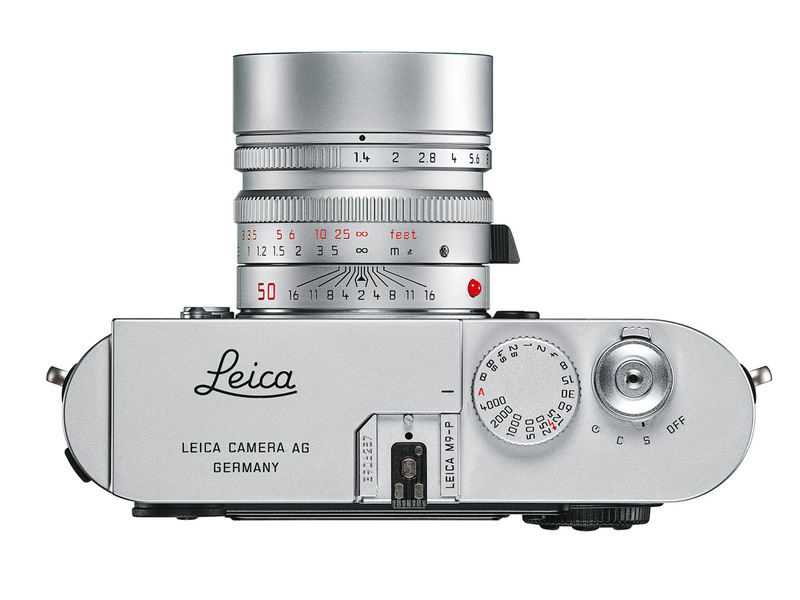 suggested retail price of the Leica M9-P is £5,395 including VAT. The MSRP for the M9-P will be $7,995.00. I'm gonna get flamed for this. But I think there should be a dedicated ISO dial. I do not think that is bells and whistles we don't need. It would make digital M more minimal, in essence. No menus to go through for the three basic elements of exposure, sensitivity of capturing plane, exposure time, and amount of light. So, we have our ISO dial, shutter speed dial, and aperture ring. In film, it was unreasonable to consider, say, ISO 64 or 200, when exposing shots, as it would be a lot of trouble to go through if I opted for the one that's not loaded. But that was then. Considering just shutter and aperture, and waving the whatever hand to ISO, is not thinking in term of best possible options. Going through menus to set ISO feels intrusive to the intuitive process of using M.
I think you are right. M design comes for ages ago, when one was supposed to change different films to get different ISO settings. But digital changes that and easy ISO control is lacking. It would be great to see some modern thinking on Leica's part; say that top big shutter speed dial, if with a press of a button or a small lever switch below (or a similar device) could be made to use as an ISO dial instantly, that would shift M- series into digital age much quicker. Interestingly the smart guys at FujiFilm worked this out for themselves and incorporated an ISO dial in a very appropriate place on the top plate where it needs to be before going to market with their lovely X-100. So what's so hard about holding a small button (the one labeled ISO) and spinning the dial on the back of the camera? As Leica says on their M9(-P) page, "Setting the sensitivity requires only constant pressure on the ISO button while simultaneously turning the dial to select the required setting." The new Sony Nex-7 has that ability. It has three separate programable dials. That paired with a Leica lens is a real object of desire. I have both the M9 (silver) and the M9-P (black), they are great cameras. The only reason I bought the M9-P is for backup, since these cameras are electronic units, they will fail sooner or later. I will not buy the M9-M, this is just a Leica marketing ploy. I seriously want it. Too bad I can't claim I need one. Did Leica ever solve the magenta/Blacks issue? In the motion picture industry we're having to use special Neutral Density filters when ever we need to use heavy amounts of ND, which is often because the native resolution of our popular pro digital cameras is around 800 iso. Yes, they have resolved it. Marcomariano...2 weeks ago I sold my Nikon D300s, and my 5 lenses, including a 70-200 f/2.8 VRII, a 17-55 F/2.8 between others in order to get a Leica M9 and a 35mm Summarit f/2.5. I have to put a lot of money on top of what I get for my old gear (I live in Australia, where everything by definition is way more expensive than any other place) ...But you know what? I don't regret a bit!...The Leica is just a pleasure to use, and I love the fact that is Manual, no gimmicks, no fancy settings that you never use, no anything. It have just 1 menu to set everything and you don't waist a single minute understanding how things work. They just do. The image quality it's simple awesome. And the fact that I carry it with me every single day is a plus. I don't have to worried anymore about what lens to use. I will say that if you are not into sport or super zooms you will love it too. Again, the Leica M is simple amazing!. I would enjoy seeing some of your shots Australia. I love Leica M. The manual nature means that I improve in my skills because I don't rely on all the automatic settings and autofocus I would have in a DSLR. This camera is not meant to replace DSLRs but its a fun alternative and yes, expensive, but the quality is great. Lenses is second to none. I've had Canon L glass and they don't come close. Lots of magnum agency pros use Leica M.
You could set your DSLR totally to manual mode and "improve your skills" for free. But of course, there would be no new gadget to show your pals and "impress chicks". Yes, true you can set a DSLR on manual mode too, but its not easy and quick to change settings as a rangefinder. "impress chicks" ??? what is that about? What a load of bull. Pick up any pro Nikon body and put it in manual mode. You'll know how to adjust every setting within 60 seconds. Shutter speed? Under your thumb. Aperture? Under your index finger - or if you buy an older lens, on the lens. ISO? Dedicated button. White Balance? Dedicated button. Where's your dedicated white balance button, Leica boy? Oh yeah, it's hidden behind a menu. You know what cameras hide stuff behind lots of menus- amateur cameras that cost $400. Please don't tell me you just compared an $8000 Leica to an entry level DSLR. The M is a great photographic tool use be many renowned pros for a reason. The M is a minimalistic camera, high quality and compact. For some its worth the extra cost and for some it is not. Skill is developing an eye for composition of light and shadows. Auto everything will not dumb things down. There are photographers who have assistants to take exposure readings. Does not make them less skillful. Being quick on dialing in focus and exposure also does not make a photographer more skillful. Being able to write with pen and paper and not rely on word processors efficiency will not help anyone write better. This is a beautiful, non-distracting camera that a true photographer would appreciate, not that this is taking anything away from the multifunctional world of the SLR. I do find the price ridiculous though, and hope for clones at 1/10th the price that can use the same lenses, just as appeared in the film days. What a ridiculous comment! !...If you are really a professional you would understand and appreciate what really Leica means. The fact that they manufacture a beautiful object too, doesn't mean that is meant to be for dandies or rich people. Leica is an amazing company that pretty much invented the 35mm format at the beginning of the 20th century, and since then it has been used for many photojournalist and renowned photographers. I'm talking about people that my art with this tool. Also no Nikon or Canon (or named whatever "professional" brand you like) lenses can achieve what a M mount Leica lens do. The fact that this beauty is expensive is simple because is made by hand in Germany, by trained technicians with a know how of a hundred years and with and astonishing quality. Not only "rich" people are willing to spend this amount of money for a Leica M, but also people that love and are passioned for photography. I reckon at the end, that is what really annoyed you. Sorry for the typo error, I meant "people that made art with this tool"
Your post just proved Mauro's point. You're paying for retro art, which is in right now, not for performance fitting the price. Leica relies on people like that. I don't see many war or press photographers using Leica's anymore. My Leica MP-4 w/ 35 and 90 Summicron's was stolen ... it was insured ... but I never felt the need to replace it. D/SLR's are just too versatile, and a GF or my LX's make a decent street camera ... with lots of other options appearing everyday it seems. A lot of people don't know this, but journalists preferred M for its film load box. They run and gun, and can't re-shoot what they shot. M can take a lot of abuse, and, even more importantly, won't leak light even when badly damaged. Film backs flip open when camera are dropped. While digital can't take much abuse, journalists now are not worried about loosing their shots stored in memory cards. Journalists who worry about loosing opportunities, still carry two film based M, despite preferring digital post processing. I believe I'm not prehistoric, I'm pretty geeky when it comes to gadgets, and new tech. I hate parties, and never, ever dress up. Still, this full frame baby is looking very desirable for me. I love everything about it. I'm deterred only by its price tag, since I'm not a pro, I can't make money off this thing. But I can see who some photographers would prefer this as their tool. That said, yes, a lot of Leica owners own it for vanity. But same can be said to a lot of owners who own exotic f/1.2 lenses, even though those lenses are built for pros. You misunderstood Jark. It has nothing to do with "retro art". He meant, just look at great photojournalists, artists, photographers, in the history of art ( as the business of advertising, publishing, wedding, etc, is what we often think first when we think pro ). Those artists do not care a bit about status associated with what they use. Whatever that make them feel most intuitive to deliver what their eyes see, to express, will be their choice of tool. Many of them chose Leica M, even in the digital era. They have their reasons, and has nothing to do with appearing fashionable, or feeling retro. A great picture is made with your head not with the tool you own! Camera is just something you use to put on paper what you see. In 1940 perhaps Leica was the only tool able to do that with great quality, today no! Absolutely no! You pay for tradition, it's ok! But every small digital camera works like a digital leica!! Try if u want! U like retro look?? Buy a fuji fx100 and it wipes away the image quality of your german tool!! And with the money u save, buy printers, inks, books.... p.s sorry for my english! I think you better like the M9-P, because when an M10 comes out, it will NOT be cheaper than the M9, but only more and more expensive. Nice work but still the same ol' M9. High time Leica added tough glass and they should stick to the classic stealth look anyway, reserve the rote punkt for the consumer range please. - Giottos glass, a perfect protective fit for the LCD. - Grainier vulcanite is nice, but hey, cameraleather.com offers neatly cut replacement body covers to your liking, if you dare to strip your M, go ahead and fit it with kid leather or Griptac. Two more cents to the Leica people: cosmetics aside, improve slow DNG buffering and bugs instead. I just killed a Lexar pro card mid-shoot with sluggish buffering, and missed quite a few frames when couldn't wake the camera without removing battery. Leica was about consciencious of the M series, more succefully by its design than its qualities (Quality/price compare with other japanese brands camera) - design based on the M2 model since 50's, not Leicaflex nor M5 of the M series) - bringing their M9 closer to this old M model, thus encouraging the rest of potential buyers ! In reality when you buy Leica, you thought about its qualities, sure, but not only. The M9-P is very beautiful, if you had already M9 and such financial possibility, change it, for your pleasure! I wish there's a M9 giveaway contest. IMHO, Leica's target market are for millionaires. If you are a photographer, that price tag is dirt cheap. Think about it. How much do you have to invest to open a cafe, start up a design studio, run a local hardware store? 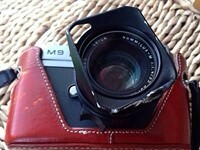 I have friends who use and abuse their M like a $2 disposable camera. And they outright told me it's a just a film container that allows you to do proper exposure. Because one good shot in a roll of film, will net them income worth a lot of Leica Ms. They do take some care to their M lenses, but mostly just not to ruin shots with dirty lens, I think. My dream camera just got better. If i would have 8000 USD, i would buy a camera body below 3000 USD, buying some lenses and spend the remaining for e.g. travelling. M9-P looks like a great tool, but not worth for the money. Good picture can be done without the Red dot and top plate scriptings. As much as I think this is built for pros, desired by hobbyist, you can hand Henri Cartier Bresson a crappy toy camera, and he'll still come up with better shots than most most M owners. M10 said to be 29MP and a very different look. Anyone know anything or have links to anything? This minimal update release could only mean one thing,.. the M10 is only three months away. Um .. Are they giving Ricoh the thumbs up fro their M mount module in advance? Will be interesting to see if anyone tapes over the place where the red dot is supposed to be .... smile. If such thing ever comes out, it will be made in China, will cost more, the sapphire glass will be a fake, and you'll be lucky if it switches on at all upon purchase. Trust me - I am from Russia. 1. Germany needs to invade Russia. 3. Americans must open second front. 4. Russians need to hurry up and get to Solms factory before Allies. 5. Pack all the prototypes and production line of Leica factory. 6. Deliver it back to mother Russia and re-assemble a production line in Moscow. So now finally I can leave this nice little piece of technology at the reach of kids without minding to have to sue them, their family and their descendants for any damage. Makes sense! Gorgeous but still impossible to focus accurately unless you have excellent eyesight. An autofocus version of this camera would sell in truckloads. I would buy 2 almost immediately for a start! Actually much easier to focus my m9 (and m7) than focus manual lenses with my 5DII (and confirm-chip adapters really miss the mark). The benefit of the 5dII is live view with magnification. HOWEVER this really does not work unless on a tripod. Hopefully the m10 will include liveview and some sort of peaking/magnification system. The m9 is a very usable camera. I do have to say the low-resolution LCD screen is an embarrassment and really needs to be upgraded. If you are going to manually focus your 5D's ... you need to change to the proper focusing screen. It's assumed you are going to AF and so they include the screen that is optimized for that application. Yup. I have a split prism focusing screen on my D200, and I use the "green dot" confirmation when I'm in a hurry. It makes for a busy viewfinder, but fast & accurate focusing. Not quite rangefinder like, but a very close second. I've heard that the high end Nikons are more often in focus than the high end Canons, which is ironic considering how Canon got their lead in the late 80's building great fast autofocus bodies (and those funky white zoom lenses you always saw at sporting events). One of the Leica M's strong selling point ( and it has very few strong selling point ) is it is easy to get your focus super fast. I prefer split screen focus on SLR. But argument is, I have to recompose after I confirm my focus, or focus before I compose. You don't have to with rangefinder, you do both at the same time. Modern DSLRs have multiple focus points, but it's still a step to select. I agree. The 2.5 in. monitor (color TFT LCD) with only 230,000 pixels is not good enough in 2011. That`s why I still will wait for the M10. The LCD with live view is a very powerful compositional tool on a digital camera. I'm also feeling that resolution needs to go up. I'm sure a lot of people will fall for this camera. I am one of them but the increase in price for some minor changes to an already expensive camera is ridiculous. I can justify spending an extra grand if they have at least improve the performance of the camera. Leicaphiles will always use the "iconic and special not for everybody camera" as an excuse for the cameras technological shortcoming. Pro photogs will benefit more using Nikons and Canons than using this. Leica M will always be a good "street camera" and that's about it. At USD1000 more than the regular M9, I think I'll just put a piece of black tape over the red logo, thank you. I have an M9 and I use more than any other camera in my possession, its beginning to look a bit battered now as I don't treat it with kid gloves on, the M9-P looks great to me but I cant see any point in buying one but I am sure many will, it looks great without the dot and lettering on the front, another classic from Solmes. If I had the money, I would buy this camera in a second and spend the rest of my life learning how to use it. I would rather have a regular M9 but many Leica shooters don't want the attention of the red dot. If it cost about 5K I will get an M9 but way too overpriced for now.. I'll stick with my M8 for now. For all the haters.. sorry but considering size/weight the M9 is as good as it gets for what it does... street/portrait/landscape. Certainly has it's faults though. Even if I could afford the basic body, then there's the price of those lenses. Yikes!!! I sometimes shoot with an old manual Leica (yes, film) and I love it. It's not for all kinds of photography, but people in this discussion who don't understand how great and fast manual focus is on a GOOD rangefinder need to STFU. With a little practice, you can get plenty of great shots. I would love this camera for certain uses. I wouldn't really get hung up on the price. You often see these cameras on eBay. People who can afford them, then get rid of them as they don't appreciate what they have. The cameras are built to last for years. "Used" is a good way to acquire one. This way, there's a good chance it will come with a lens as well. The price is out of line, a money grabber. This is a terrific addition to an already excellent product line of one of the most innovative companies in the world of photography. A truly welcome set of features, which were all missing in an M9 Titanium edition. Pity that issue of an M9 was rather an exercise in an idea on how to transform a photographic tool into the sports car, or a set of premium wheels, by one of the most over talented automotive designers in the world. Coming back to photography also means coming back to people who will really use this camera. Welcome back! What ever happened to the camera as an extension of the eye? Professional photographers will be flocking to get one of these pretty manual focus only bricks, I'm sure. Now get these back to the size of an X1 with the same capabilities and we'll talk. I'll stick with my Ricoh GR-D for photos where I need to capture Images a la Sauvette with a discreet camera as the Leica M series does not offer me anything my D700 does not already provide. It is news to me that Leica have 500mm , 600mm, 800mm tele lense to snap celebrities in the beach. It's for the R system, but hopefully the m10 will have liveview . . .
Just learned you can't post images or edit your comments! Nice, charge people a grand to get an upgraded LCD that is already available on the M8.2 or was an upgrade option on the "Your investment is future-proofed" M8 / original version. As a professional user of Leica film gear for strictly black and white documentary work, I would *LOVE* to see another company come out with a better RF camera that will take M mount lenses, be weather sealed, 12-18 MP FF with high ISO as good as the D700 or better for about $3,000-$4,500. Their film bodies are outstanding, a fraction of the price and I have dropped all of mine at least once onto concrete never resulting in more than a RF adjustment if that. But these $7,000-$8,000 digital versions and the price of new glass is just plain stupid. Fo the price of an M9 and 35 1.4-II, I got a Nikon 35 1.4 G, a mint used Leica 35mm F/2 asph, Fuji X100, top of the line Mac Pro with SSD and 64 GB of ram and enough Tri-X and paper to shoot two book projects and print 4 shows. Well put! What price glory in a technology that shifts so rapidly, too. If I was not retired I'd get this Leica. Manual focus is as fast as AF and since the photographer selects the exact area to be in focus, manual focus is more consistant than AF. The limitation would be the frame rate in certain sports. But for people shots then this camera is fast enough. Yes Leica does indeed have telephoto lenses, starting back from before WWII, made for the Olyympics. I use an Leica M5 and a Seiko/Epson R-D1 both have a single frame manual shutter advance and a rangefinder focusing mechanism. I rarely ever miss a shot with these cameras. But it does require skill, and experience. I agree this is a Leica Pro M series camera, and in the right hands it's as good as any other camera on the market today. For the most fullfilling photographic experience nothing compares with a Leica. The image quality is right up there for even the most demanding applications. LOL, when the celebrities come out of restaurant or courtroom, they expect journalist to manual focus their M9 and get the shot? Does leica have the tele-lenses for the paparazzis to take the celebrities sun tanning or making out? yeah it was a pro camera, in the 70's. Leica M rangefinders are a different breed of cat. A camera that requires a more thoughtful approach to photography. It is very small and very durable. My M8 is still chugging along cranking out great shots. I would really consider the silver chrome version as the black version is painted and I hate it when it starts to rub off (leicaphiles call it "brassing" and view it as a badge of honor - I'd prefer my really expensive camera to not rub off on my hands). Oh yes, I'd love to have one, but my life may never see such luxury. My heavy D200 better last a few more years. I also have a heavy D200. I was surprised to learn that the 5D is lighter than the D200. I solved the heavy D200 problem by getting a cheap, used, light-weight Nikon. The D7000 does everything the D200 does and better and costs way less than the Leica. This beautiful camera is another piece of jewelry for the rich and decadent. Precious few will see service in journalism. I would love to have one. I will have to hope for a professional MFT camera and what few additional Leica lenses will be offered for it. Of course, some people would say that "professional" and MFT are by design, incompatible. Still, I believe I would be OK with that. Just can't justly, much less afford a M9. Why is it soo expensive? Is it because of snob value? If M9 was around 2k USD, many people were going to buy it including me. I think the main reason that makes buying M9 so controversial is not its quality that is great but its ridiculous high price. for me it is a great camera for 2k and not more. for 2k, I surly bought one already.